China can outlast the US. China’s leaders aren’t afraid of public pressure to give in to Trump. Despite claims to the contrary, the impact of tariffs on US consumers is being felt – and the pain, while minimal today, is growing. The tariffs, intended to bring back manufacturing jobs to the US, are actually forcing US manufacturers to find other Asian countries that will make the same stuff China currently exports. Agriculture is getting hit hard. China used to buy about $20 billion of our agricultural exports; that number is down significantly. Retaliating against the Administration’s initial and follow-up tariffs, China increased tariffs on pork to 70%, effectively locking US producers out of a very lucrative market. 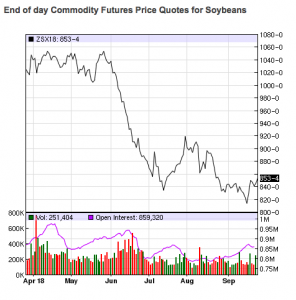 The price for soybeans, one of our largest exports, is down about 20% over the last six months. The US is the largest soy producer in the world, and China used to be our biggest export market. As a result of the Trump tariffs, China is buying its soy, pork, corn, and other products from other countries, entering into long-term contracts with planters in Brazil and Argentina and elsewhere. While some will claim they’ll switch back when the trade war is over, that’s highly doubtful given the unpredictability of the Trump Administration. The trade war is a double whammy for ag equipment manufacturers; steel and aluminum prices are up substantially, while demand for their equipment is down because farmers’ finances are on shakier ground. Certain types of steel commonly used in ag equipment is only made in Canada or Mexico, so equipment manufacturers have no choice but to pay the 25% tariff. The US imports more steel than any other nation; over 34 million metric tons last year alone. When manufacturers have to pay more for steel and other materials, they pass that on to their customers. So, prices are up, which may well drive down demand. A Federal Reserve analyst looked at the impact of the tariffs on manufacturing; the results are troubling. For work comp folks, we know that recessions lead to higher initial claim frequency, followed by longer-term disability duration. Things look good now, after a 10 year economic expansion. That will not last, and when it ends, it will be ugly. I thought this was a managed care/workers’ compensation blog/post. It seems more and more to be turning into a Democratic political blog. Not what I signed up for. Hi Mike – thank for the note. First, as you note this is a managed care/work comp blog. The post itself is not political at all – it is about public policy and the implications for employment and workers comp. Facts are facts – and policies have implications. You’ll note that in the “what this means for you” section I specifically describe the impact of the trade war on workers’ comp. Second, of course you can disagree with anything I say; exposing oneself to alternate views is healthy and needed in these days of a divided polity. Third, while I hope you remain engaged, I will certainly honor any request to unsubscribe. Just let me know. Any comments on how: China’s theft of US intellectual property, China dumping steel and many other products in our market at below cost prices, currency manipulation, requiring US companies setting up manufacturing in China to do so through a JV with the Chinese government and requiring those companies to establish R&D labs in China (thereby further enabling technology theft), as well as a whole host of other unfair trade practices since China was allowed into the WTO in 2001, has affected US GDP and employment? I’m sorry to enlighten you but we’ve been in a trade war for years and we’ve been losing big time. Your argument that China can outlast us because their leaders are not elected is only correct if people who are usually thoughtful and reasonable don’t promote fear and division, which I think, whether intentionally or not, your post does. Personally I prefer to see thought leaders like yourself promote the idea that playing the long game and doing the things necessary to fix these imbalances is exactly the right approach. Conversely, we end up electing leaders that are too afraid of doing the right thing for fear of not being re-elected. This is not a political issue, its purely economic and should be treated as such. The Chinese are playing go, and we are playing tic-tac-toe. The issues at stake involve far more than trade secret protection; they include North Korea, the South China Sea and right to navigate that critical body of water, the US debt and deficit, China’s Silk Road policies, Chinese influence in Africa and key markets in South America, the survival of American agriculture in a form other than huge factory farms and much more. As to your assertion that my post somehow promotes fear and division, I wholeheartedly disagree. If people aren’t comfortable with facts or different opinions, than that is a far more concerning problem. Frankly I’m puzzled as to why you would think that a fact based post with multiple citations promotes fear and division. I vehemently disagree with the current Administration on many points, and objecting to same is the right of any and all. It is enshrined in out Constitution in many ways, just one of which is freedom of the press. Playing the long game is precisely what we were doing before we blew up the Trans Pacific Partnership which was intended to control Chinese influence around the Pacific Rim. Finally, I’d suggest there are NO purely economic issues in global policy, a fact the current administration appears not to understand. Everything is inter-related, and failing to understand that puts us in a strategically untenable position. Happy to discuss over coffee or libation at your convenience. Thanks Michael – appreciate your perspective and willingness to engage civilly. That’s very welcome!